African countries barely existed when the United Nations adopted the Universal Declaration of Human Rights in Paris, France in 1948, three years after the end of the Second World War. It was the first time an internationally agreed document unequivocally said that all human beings are free and equal, irrespective of their colour, creed or religion. But then, vast swathes of the continent were under Western colonial rules and just four African countries: Egypt, Ethiopia, Liberia and South Africa were members of the United Nations. All but South Africa signed the Declaration. Yet, the Universal Declaration of Human Rights would later help propel individual territories, starting with Ghana, into nations and inspire the continent's own Charter of Human Rights aimed at ending abuses and later ushering in democratic states. Nearly a decade after its adoption, Kwame Nkrumah, Ghana's then-prime minister would echo the Declaration as he celebrated the independence of his country. “At long last, the battle has ended! And thus, Ghana, your beloved country is free forever!” he told throngs of clamouring revellers at the Old Polo Grounds in Accra, the capital city, on 6 March 1957. The former British colony had just become independent. Thus, with his statement, Nkrumah channelled the overall principles of equality, freedom and justice for all people no matter where and who they were, embodied by the Declaration. Such remains the significance of the event: Ghana's independence, the first in post-war Sub-Saharan Africa, the country itself and the rest of the African continent, that the ground, located at a walking distance from the rumbling waves of the Atlantic Ocean, has since been turned into a public park hosting a mausoleum where Nkrumah and his wife’s remains are, as well as a small museum dedicated to his role in the country's fight for self-determination and the continent-wide pan Africanism movement. Underscoring the relevance of the Declaration to the fight of political self-determination in Africa and within months of his country, the Democratic Republic of the Congo (then Republic of the Congo), becoming independent in 1960, Patrice Emery Lumumba, an historical figure of the continent-wide independence movement would emphasise that the question of self-determination in Africa is one of basic human rights for all. “Let it [the West] today give proof of the principle of equality and friendship between races that its sons have always taught us as we sat at our desks in school,” he said at the University of Ibadan, Nigeria – an intellectual and academic powerhouse in colonial Africa, “a principle”, he added, “written in capital letters in the Universal Declaration of Human Rights”. But even as the Declaration was being adopted, it was paradoxical that its most enthusiastic supporters such as Belgium, France, Great Britain, Portugal and Spain, still possessed colonies in Africa where most natives were subjects and not citizens. The right to asylum, to freedom from torture, to free speech and to education are some of the 30 rights and freedoms contained in the Universal Declaration of Human Rights. The document also addresses civil and political rights, including the right to life, liberty and privacy in addition to economic, social and cultural rights. It’s notable that of the four African state members of the United Nations in 1948, South Africa was the only one not to have signed the Declaration. Its refusal was an indication of the profound contradiction between their apartheid project and the Declaration. In retrospect, they appeared to have foreseen the potentially disruptive nature of the impact of the Declaration on the prevailing political situation in their own country as racial discrimination and segregation, also known as apartheid, were institutionalised in the country, the same year the Universal Declaration of Human Rights was adopted. Unsurprisingly, anti-apartheid activists would draw from the spirit of the Declaration in their fight against apartheid when, in 1955, “people from all walks of life [would meet] as equals, irrespective of race, colour and creed, to formulate a Freedom Charter for all people in the country”, according to the then-president of the African National Congress (ANC), Chief Albert Luthuli. 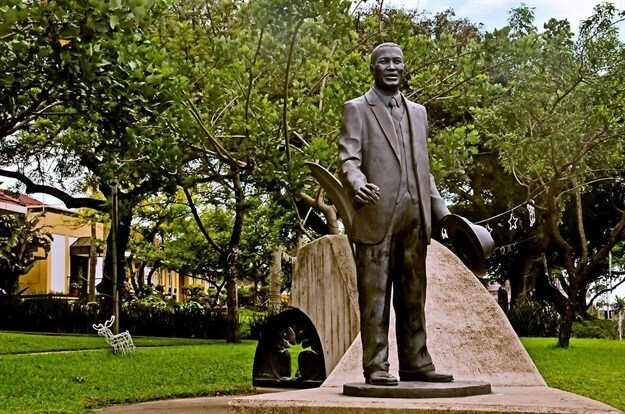 Luthuli, described by the Nobel Foundation as “the leader of ten million black Africans in their nonviolent campaign for civil rights in South Africa”, would later be Africa’s first Nobel Peace Prize Laureate in 1960. African leaders had framed their quest for national independence as demands for justice, equality and dignity for all, yet the overall first two decades of their existence were routinely marked by human rights violations. In most countries but not all, authoritarian or single-party regimes had replaced elected ones. In an attempt to address criticisms and advance human rights protection across the continent, the continent adopted its own Charter on Human and People’s Rights which came into force on 21 October 1986. The Charter purports to promote human rights from an “African perspective”, including by emphasising collective political rights and the right of national self-determination. “The committee that drafted the Charter was guided by the principle that ‘it should reflect the African conception of human rights [and] should take as a pattern the African philosophy of law and meet the needs of Africa’, Amnesty International observed in an educational publication about the Charter. Still, the Charter clearly acknowledged the Universal Declaration of Human Rights in its preamble and explicitly recognised civil, political, economic, social and cultural rights. “The Universal Declaration is strong and alive,” UN Human Rights chief Michele Bachelet remarked last September in a statement in New York. The Declaration “has empowered millions to march, to come together and to build progress”, inspiring, Bachelet added, “women and men to demand an end to discrimination, tyranny and exploitation”. In several countries across the continent, including in Cameroon, the DRC, Gabon, the Gambia, Kenya, Niger, Madagascar, Mali, Senegal, Tanzania and Togo, people regularly took to the streets to demand equality, fairness, justice and dignity. Under popular pressure, many African countries moved away from authoritarian regimes and opened up their political space over the last two decades. Competitive elections are held even if not always deemed free and fair. And progress have been made in relation to freedom of speech and associations with vibrant civil societies advocating for transparent and accountable governments. From colonies to independent states and later to more open and pluralistic societies, Africa certainly has moved forward. Article published courtesy of [[https://www.un.org/africarenewal/ Africa Renewal.